her own conclusion after reading the latest medical research and going through it herself. This will empower you as parents, to find the right solution/s for your family. This comprehensive book includes baby whisperer settling secrets that you can use right now to help your settle your baby. It explains the key settling elements, as well as advanced techniques that are particularly effective when dealing with hard to settle colicky babies. Powerful settling techniques to help your baby right now. A full range of options to address the underlying cause/s of colic. The pros and cons of each option, to help you decide what to try. Why there is so much argument about what causes colic. That colic is NOT caused by stressed-out parents. 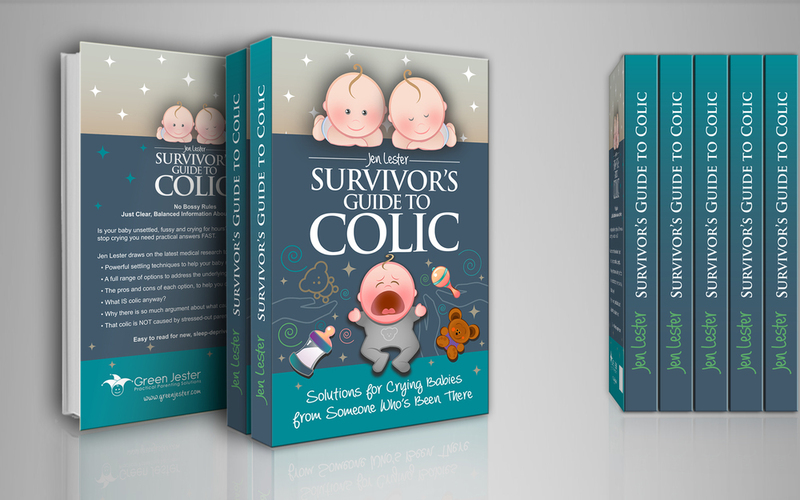 Survivor’s Guide to Colic also gives you the lowdown on a range of issues that parents of colicky babies often wonder about including burping, baby massage, lactose intolerance and other food allergies, reflux, changing formulas, probiotics, herbal remedies, gripe water, lactase drops, overstimulation, constipation, swaddling, white noise and other calming sounds etc. Confused by all the Conflicting Information about Colic? When you are a tired parent of an unsettled baby, it seems like all the information out there is conflicting and inconsistent. It can be incredibly frustrating when all you want to do is help your baby. The reason for the conflicting information is that there is fierce disagreement between experts about what causes colic and how to treat it. It is also complicated because different babies appear to respond to different techniques/solutions. Parents of colicky babies often have lots of questions. Sometimes burning questions. You might be wondering if your question will be covered by the book, so we have put together a list of common questions and grouped them by topic. The book covers all these issues and more. My baby cries a lot, but how do I know if it is colic? How many hours a day is ‘normal’ for a baby to cry? Is it normal for a baby to pass wind (fart) like this? My fussy baby seems to resist all attempts to soothe her – is that normal? What are the best, most effective, settling techniques I can try? Will swaddling help a colicky baby? How do I swaddle my baby and are there different options? What kinds of sounds or white noise help babies the most? Why does my colicky baby refuse to take a dummy/pacifier? What are the main theories about what causes colic? Why do some people say colic does not exist or there’s no such thing as colic? Why do experts argue about what causes colic? Why do experts argue about what to do to help with colic? Why do some people say there’s nothing that will help colic? Will burping help with colic? How do I burp my baby well? What are the best burping techniques? What do I do when the burp won’t come up? Do different bottles (such as bottles with active or positive flow) help with colic? Could my baby be lactose intolerant? Could my diet be contributing or causing my baby’s crying? Is my baby allergic to my milk? Would a different formula help? Are there herbal remedies that help colic? Do lactase drops help babies with colic? Will probiotics stop my baby crying? My friend said that gripe water can cure colic, is that right? Does gripe water work? I’ve heard that overfeeding or feeding too often can contribute to colic – is that right? Is the crying happening because my baby is overtired? What can I do if my baby is overstimulated? Does baby massage help with fussy babies? If so, what massage techniques can I use? I’m wondering if it is constipation because my baby always goes red in the face and seems to be straining? I’m wondering if my baby's crying is caused by reflux instead because my baby often possets? Could my baby’s crying really be caused by allergies? Remember: there are other medical conditions that can cause excessive crying in infants, so it is important to see a doctor to rule out any other underlying medical condition, before assuming that your baby has colic.